Two strands of digital connectivity infrastructure are most relevant in the UK urban policy context – fixed and mobile networks (as set out below). The UK performs well by international standards for the provision of superfast broadband and 4G mobile coverage but lags on fibre provision. Cities, national government and infrastructure firms are all making significant efforts to support investment in fibre and the improved 4G and future 5G mobile networks that will rely on it. Copper – Data sent across existing telephone lines from exchanges. Supports broadband. Fibre to the cabinet (FTTC) – Copper or cable connections into homes from nearby fibre-connected cabinets. Supports what the Government calls superfast broadband (download speeds greater than 24Mbps). Upgrades set to increase speeds significantly. Today the UK and its cities, in particular, enjoy, by international standards, cheap and effective fixed broadband (greater than 10Mbps) and mobile digital connectivity. It ranks 7th out of 28 countries in the EU5 – behind only Denmark, Sweden, Finland, the Netherlands, Luxembourg and Ireland but above other large countries. Superfast broadband (greater than 24Mbps) is now available to over 95 per cent of UK homes,6 supported by the Department for Digital, Culture, Media and Sports (DCMS) through its £1.6bn Broadband Delivery UK investment programme. 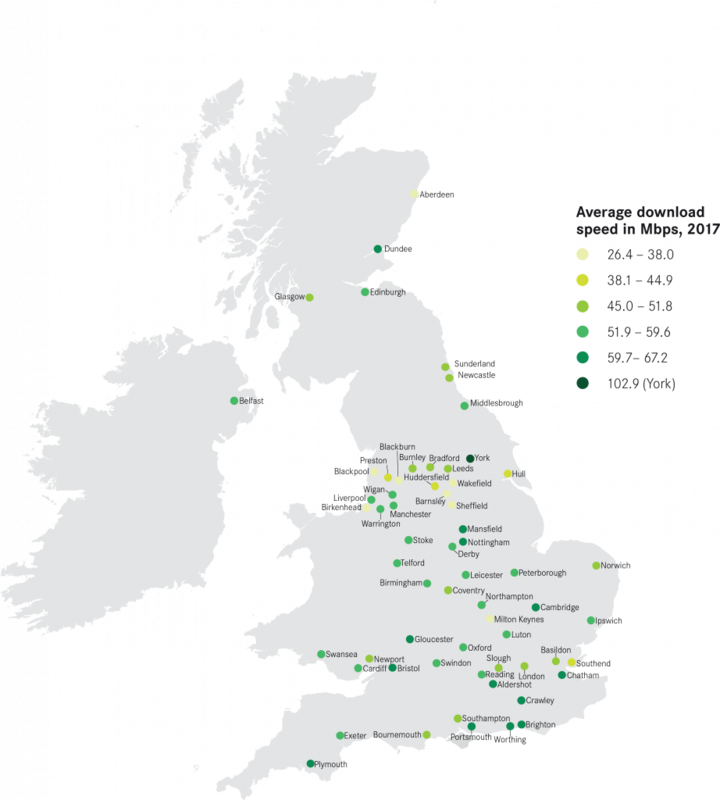 Within the UK, average download speeds vary across cities (figure 1). More than half (53 per cent)7 of urban addresses can now access fixed connections faster than 100Mbps, with around 4 out of 5 of these also able to access speeds of over 300Mbps.7 These are driven by the spread of fibre to the cabinet (FTTC) found on most city streets before copper or coaxial connections connect into properties. Compared to its European neighbours, the UK performs below average on 4G download speeds, but does better on coverage.13 Mobile connectivity has improved and expanded rapidly, mostly led by private sector investment. At the end of 2017, 93.6 per cent of premises in urban areas in the UK had 4G coverage outdoors.7 Indoor 4G coverage in urban areas rose to over 64 per cent in 2017 from 45 per cent the year before,7 and there are now over 50 million 4G mobile subscriptions in the UK7 since 4G’s introduction in late 2012. But the quality of coverage varies across networks and between and within cities, with London having the best and worst speeds depending on the network.17 At peak times – such as at football stadiums during matches or at train stations at rush hour – networks slow or reach capacity. Tall buildings, narrow streets, glass and steel constructions pose problems for coverage, a particular issue that the City of London is tackling in case study 2 below. More masts and cells, more spectrum and smarter data compression can all help to address this issue. As data demands have grown by almost 50 per cent every year,7 networks have increased the number of cells, each requiring permission, power, fibre and somewhere for the units to be attached. 5G – More than 20 times faster than 4G with latency (time it takes to send and receive information) a tenth of that of 4G. Capacity fo more internet-connected devices. 5G networks offer higher speeds and greater capacity. They can improve the user experience of current applications and overcome existing network bottlenecks such as at train stations at rush hour or major sporting events. But 5G also has the potential to be transformative in how digital connectivity can be used. While earlier iterations have improved connectivity between people, 5G supports far greater connectivity between devices on a scale not possible with existing technology. These devices are able to communicate directly with one another, creating the potential for a far more complex but seamless ‘Internet of Things’. 5G’s greater capacity and lower latency could improve the safety and effective traffic capacity of existing road networks as vehicles could move in unison and at higher speeds. Infrastructure monitoring could be improved by connecting more sensors than is possible today, improving maintenance and reducing stoppages due to inspections or failures. Advanced robotics and 5G could transform manufacturing and healthcare as sensitive tasks requiring real-time responses and feedback, currently only possible for a human to carry out in person, are made possible remotely. Why is 5G rollout different? The shorter range of the higher frequency radio waves that 5G uses will require many times more cells in cities than the 4G network. Each cell must be connected to its own fibre and power connection. 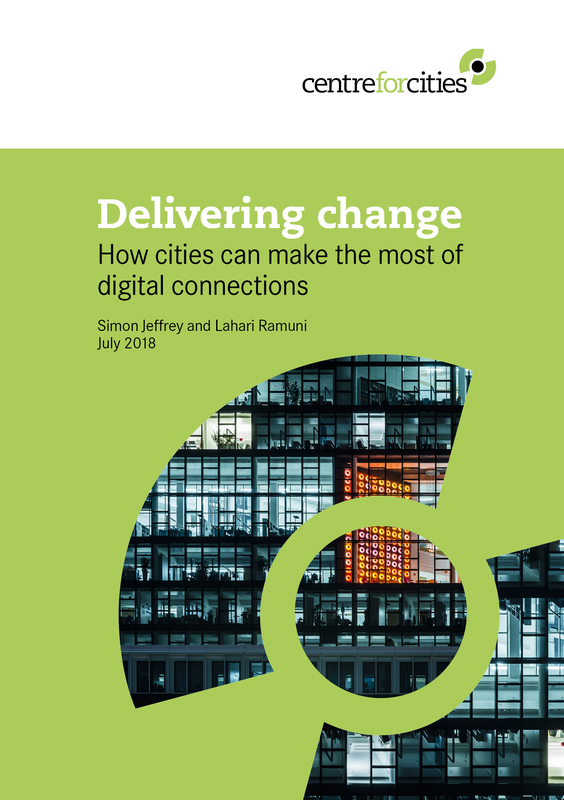 Building and maintaining this network across UK cities would require far greater interactions between network and infrastructure operators, landlords and planning authorities than for previous rollout of new technology.